One of the best explanations I’ve ever heard about ma la is from Netflix’s anime series, Food Wars. 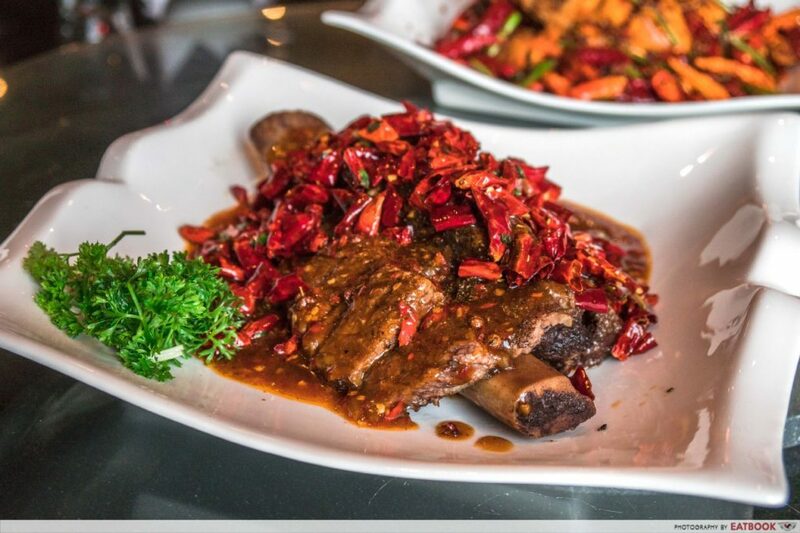 In one of the episodes, the Japanese cartoon show waxed lyrical about the Chinese philosophy behind ma la wei (flavour), and said that a good ma la dish needs to not only be spicy, but has to leave your tongue numb and deliver a memorable aftertaste of Sichuan peppercorn that’s so delicious, you can’t help but wipe the plate clean. 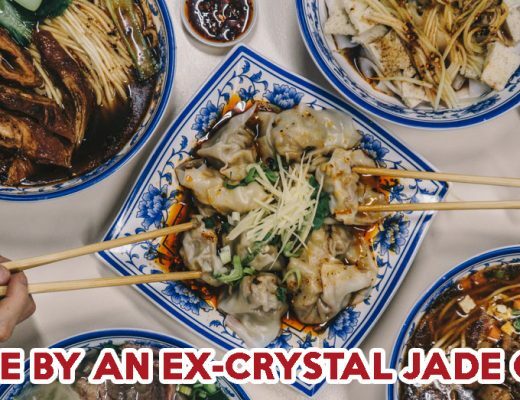 Ever since that episode, I’ve always wanted to try legit Sichuan cuisine, and I finally did at Hong Kong’s one Michelin-starred Qi – House of Sichuan, which opened its first Singapore outpost at Marina Bay Financial Centre. I was ready to suffer the moment I settled down. In fact, so was our host, who reminded us that milk ($5++ a cup) was readily available should we need to quell the burn from the dishes. So when I scooped out a piece of Chili Oil Wantons ($12++) from the sharing plate, I did not overload it with the devilishly red base. 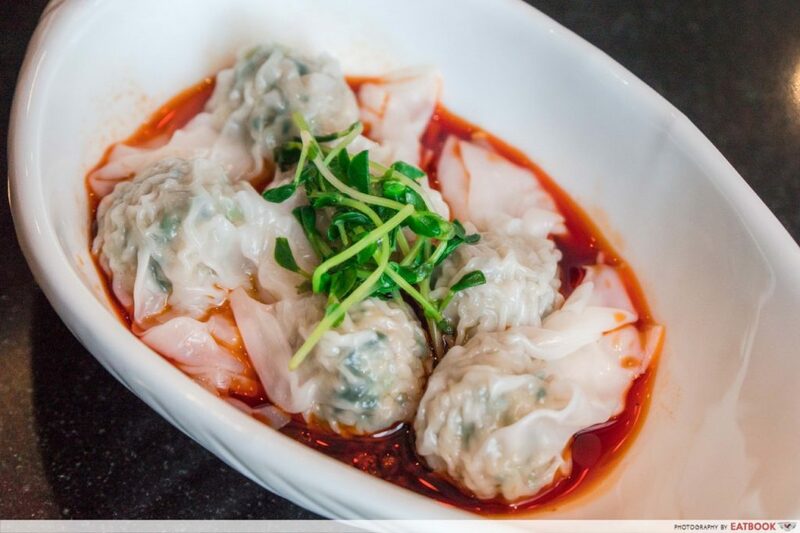 What made these dumplings great, was the fact that the skin was smooth and paper thin, but not to the point that it would easily break under my terrible chopsticks skills. The pork and prawns were well minced too. 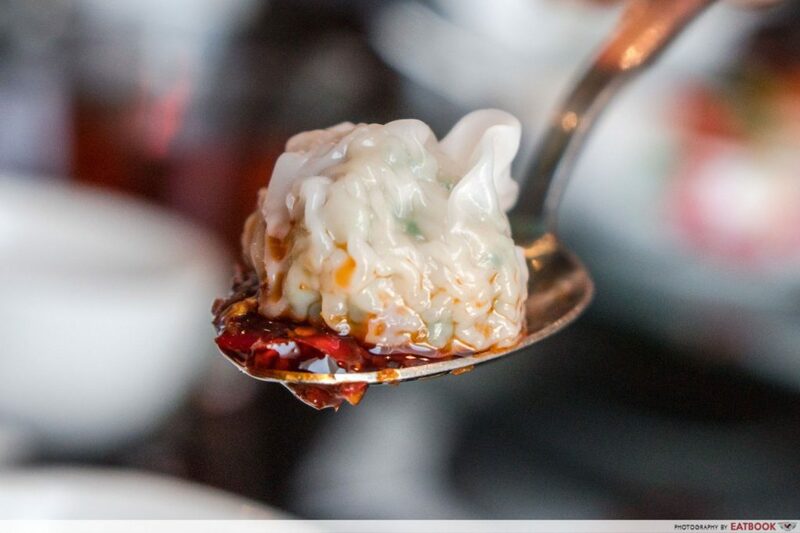 And even though I was a coward, I still managed to choke on the chilli – but in a good way – as the wonton slid down my throat with ease. 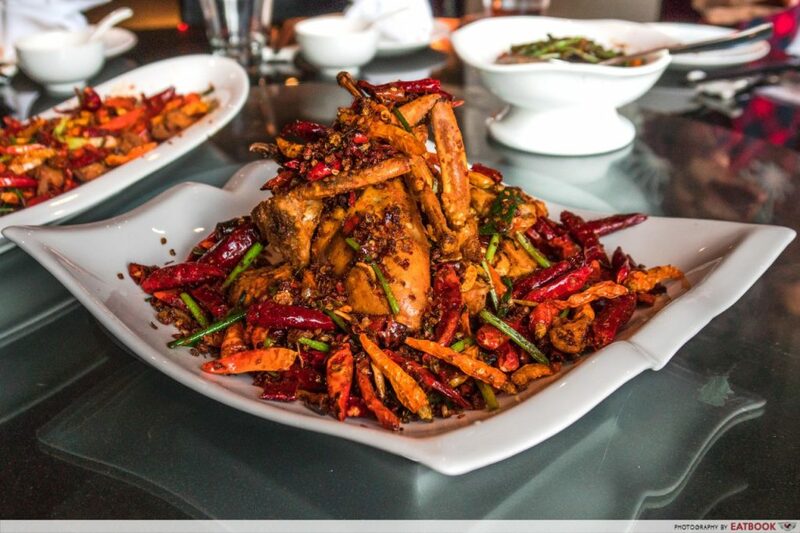 Bringing children to a Sichuan joint isn’t such a smart move, especially since most of the dishes are laden in cut chilli and spices. 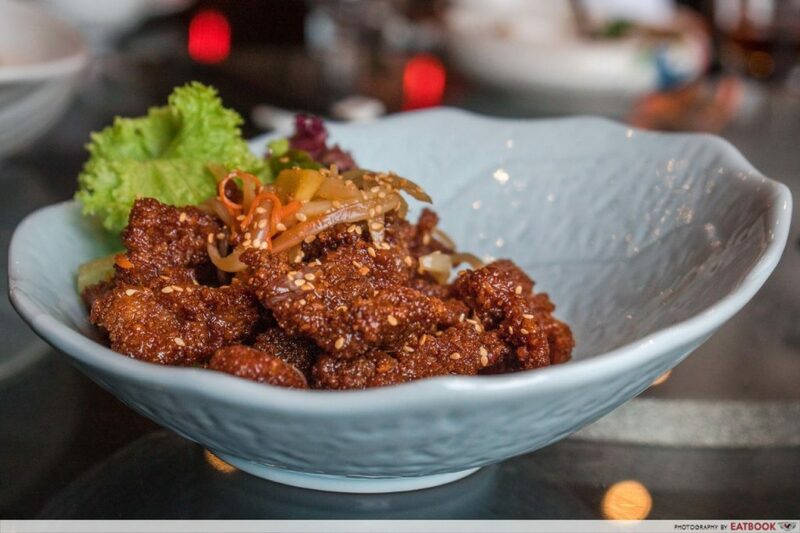 But in the event you have a little dining companion, a safe choice for them would be the Sugar Glazed Ginger and Scallion Beef ($25++). 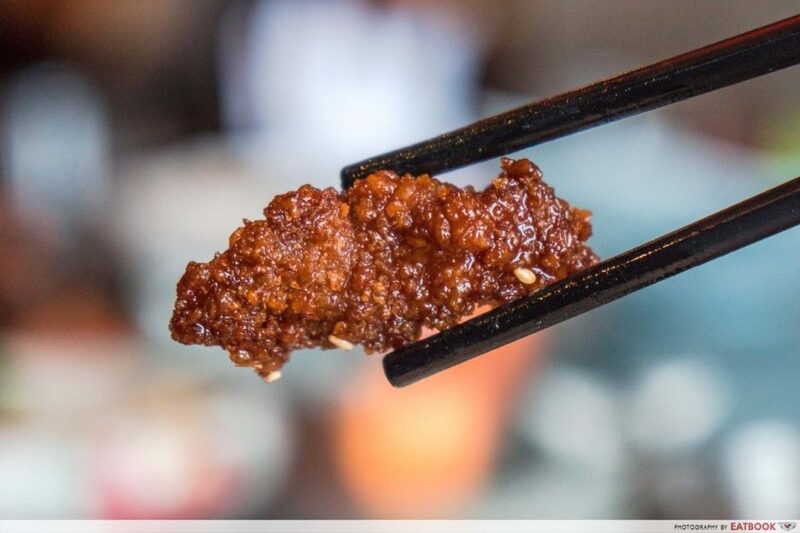 The beef was surprisingly tender, and the sugar glaze made the deep-fried treat even crispier than it already is. Stir-fried in a sweet and savoury sauce that reminded me of gu lou yok, it had no hint of ginger, despite its name. 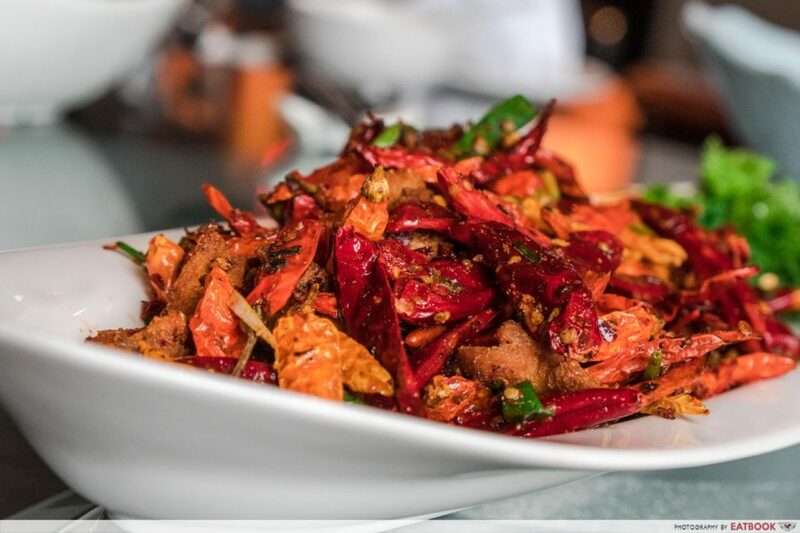 Buried under a mountain of dried chilli peppers was the Crispy Diced Chongqing Style Chicken with Cashews ($38++) – or la zi ji if you prefer. We literally had to sift through the red chillies to obtain a piece of golden chicken cube. As for the cashews, I couldn’t find any. Our host requested for a less spicy version to ease us in, so it wasn’t as spicy as it looked. I did feel that there should have been more seasoning and peppercorns though, as this main felt rather flat in comparison to the next few courses. 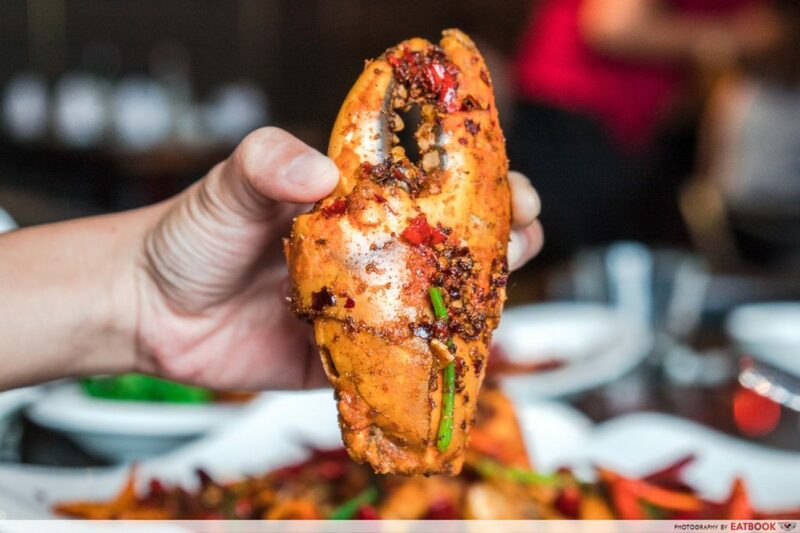 The Chili Fried Sri Lanka Crab ($115++) makes our Singapore chilli crab gravy seem like ketchup. 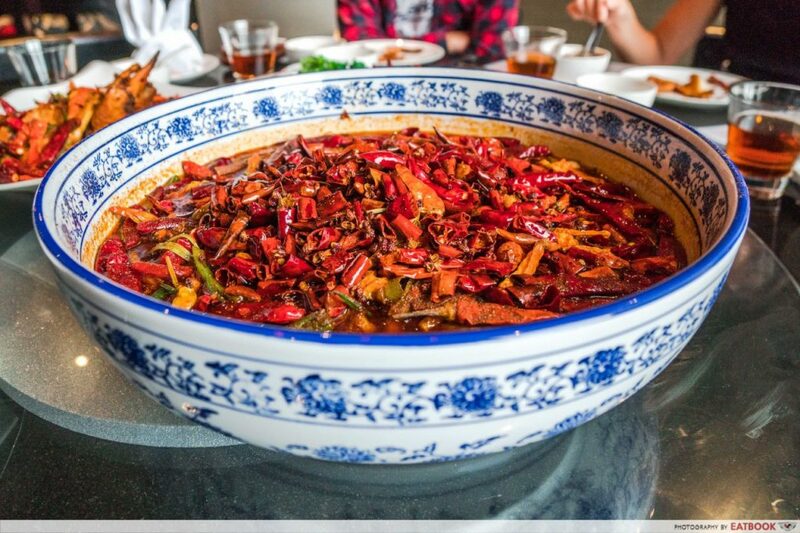 Instead of being doused in sauce, it’s surrounded by Sichuan peppercorns, chillies, and scallions. The flesh of the crab was plump and firm, and the heat slowly developed into a more intense burn with every bite. I liked how the shell was easy to peel off, and I didn’t need to use the accompanying crab cracker provided. Beef short ribs are known to become softer the longer they are cooked, and the Slow-Cooked Black Angus Beef Short Ribs with Mala Sauce ($75++) was meltingly tender; it’s marinated in black pepper and sea salt overnight, and stewed for three hours before being grilled. The beefy flavour was pronounced, and its luscious richness complemented well with the sharp ma la sauce it was doused in. 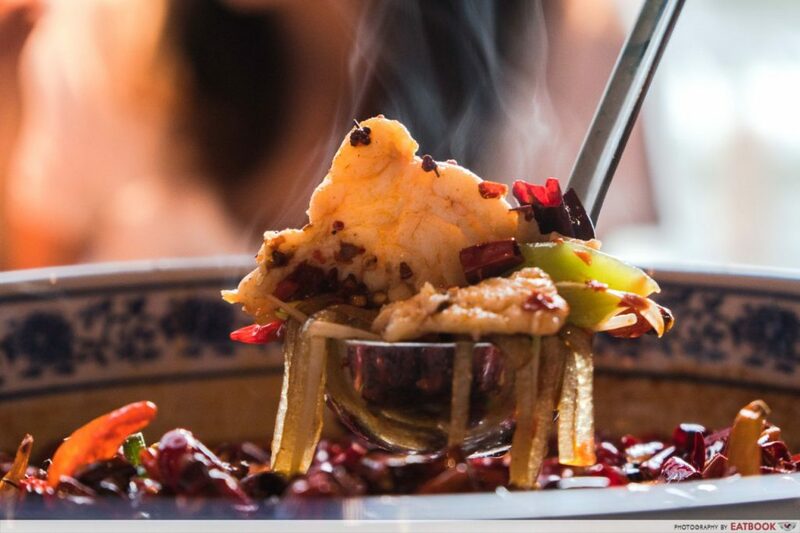 Your trip to Qi – House of Sichuan would not be complete if you didn’t order the Braised Garoupa Fish Fillet in Chili Oil Soup ($40++ for small, $50++ for large). I would recommend just ordering the large size, as for an additional $10++, you get a really massive portion! 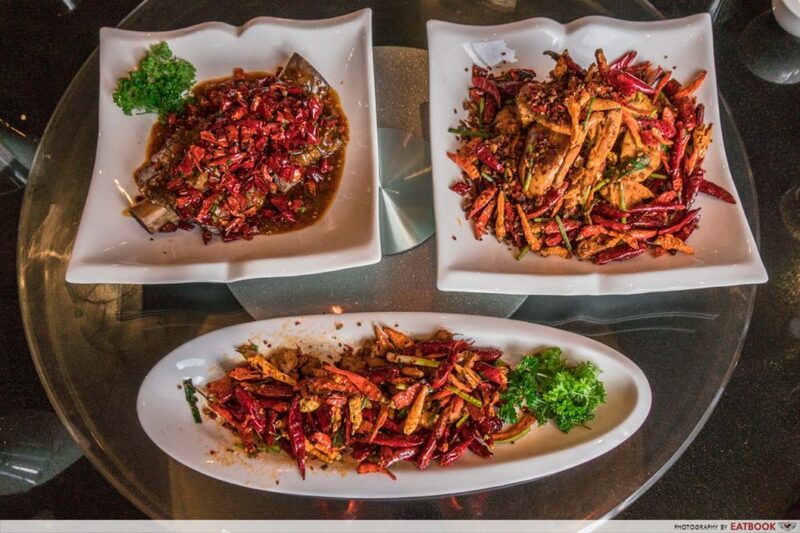 Underneath the avalanche of chillies are thick slices of braised grouper fish fillet, mushrooms and sweet potato noodles. 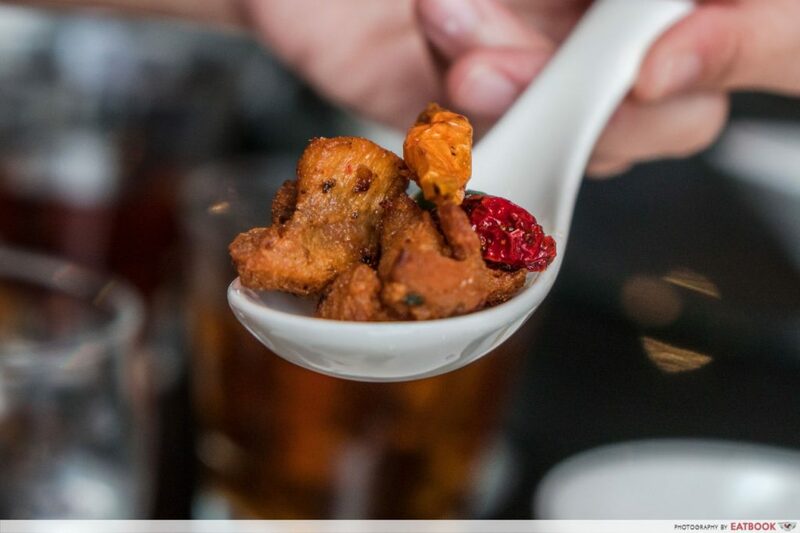 The dish looked horrifying, even for a spice lover like myself. Our host asked the chef to make this dish less spicy, but tiny beads of sweat were still forming on my forehead when I cautiously took my first sip of the soup. And if you think eating the chewy noodles would quell the burn, you’re mistaken – I was met with a sharp fiery burn at the back of my throat. After five mouthfuls, my mouth was numb and my ears were ringing. 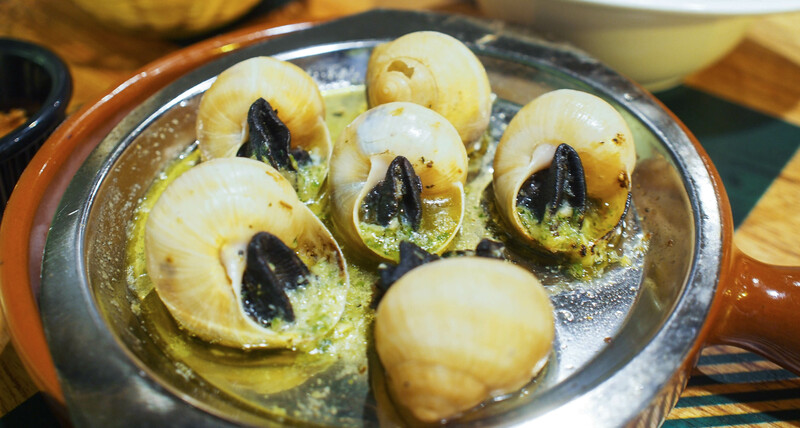 It was the first time I actually felt the tingling sensation of ma la, even though I’ve eaten so many ma la xiang guo in my life. We got lost finding the restaurant, but if you know your way around Marina Bay Financial Centre, you should be able to find it quick. If not, just head to Marina Bay Link and ask the mall’s concierge to guide you! 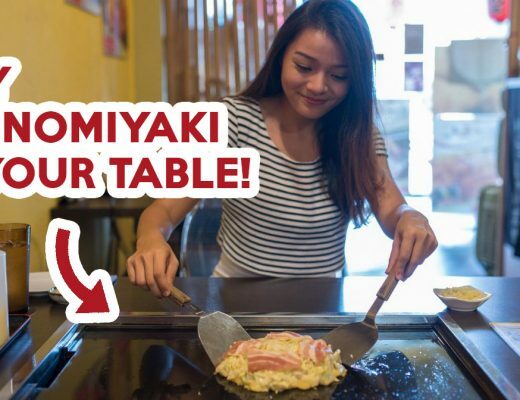 Space-wise, the 90-seater restaurant is chic, yet at the same time, casual, and will make a great place for family gatherings, meet-ups with friends, or even a sizzling hot date. At the end of the meal, my dining companions and I were saying how our stomachs were most probably as hot as the pits of hell. The next time I’m back, I will challenge myself and order the dishes just as they are to see if I can take the heat. 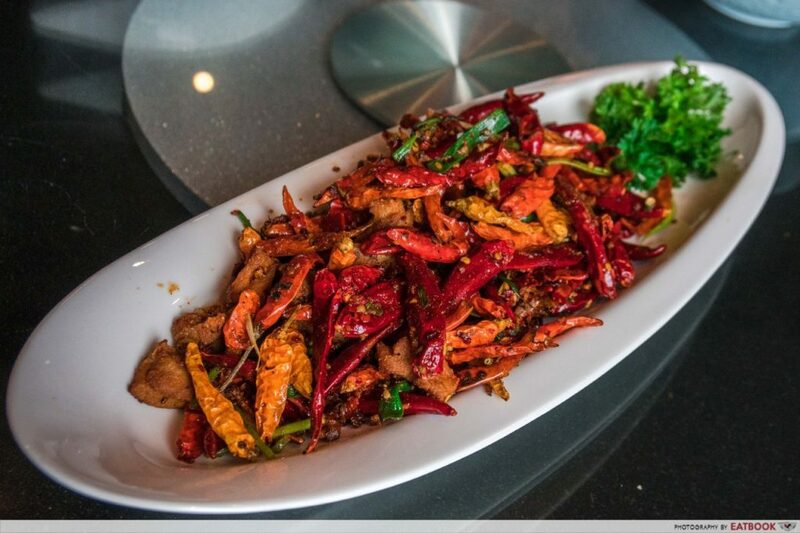 Check out these spicy restaurants if you think this Sichuan joint is not hot enough! 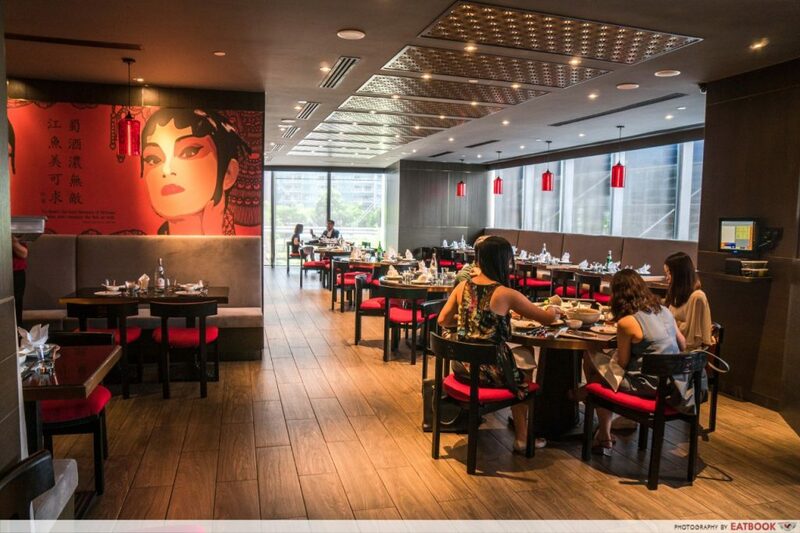 This was a media tasting at Qi – House of Sichuan. Recommended dishes: Chili Oil Wantons ($12++) and Braised Garoupa Fish Fillet in Chili Oil Soup ($40++ for small, $50++ for large).